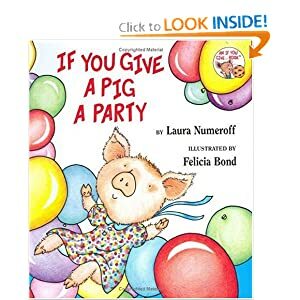 Our book for today is, "If You Give a Pig a Party" by Laura Numeroff. Our activity was balloon painting. I blew up a balloon and put some paint on a plate. I gave Aubrey a piece of construction paper and let her paint. Aubrey loved painting with the balloon. She was so surprised when I said she could put the balloon in the paint! By the time she was done, the balloon was filled with paint. Great for messy, squishy fun!! **Please use caution if you do this activity. Balloons can be dangerous for children.